Diamond Band Saw Blades have proven the be an effective diamond machining tools on a large variety of materials and applications. With diamonds firmly attached to ultra thin metal body, Diamond Band Saw Blades remain the tool of choice for many diamond cutting and machining jobs. Only the highest quality raw materials are used in the manufacturing process. Manufacturing process is carefully controlled, matching your application with the right bond type, grit size, bond hardness and composition. Average Band Saw Blade Life: 40 to 80 hours. Some has shown to last as long as 192 hours. This process utilizes a flexible, toothed blade is welded into an endless band that rides on wheels driven by two pulleys and is guided through the work cut off or contour. A band saw’s blade is diamond coated by electroplating, a process in which an electrical current deposits the coating onto the blade. This produces a hard, brittle Ni matrix that holds the diamonds in place and permits precise cutting on a variety of materials. Ideally Diamond Band Saws Blades should be used on Diamond Bland Saw Machines. A friction saw is a special band saw capable of achieving band velocities of up to 15,000 sfpm or more. Material removal is accomplished in two steps: frictional heat softens the substrate, and the teeth scoop out the molten material. 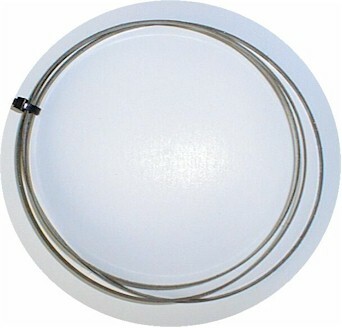 Carbon steel bands are used for flexibility to obtain maximum band life. Method is excellent for cutting extremely hard substrates. All diamond band saw blades are custom manufactured to fit your exact material, needs, and application requirements. We will work with you to determine your needs, and recommend the right parameters for your specific material / application. Standard Lead Time: 3 to 5 work days. Faster lead times are available upon request. ** Note that kerf loss is dependant on diamond grit selected. With new developments of advanced materials, the diamond band saw blade has played a key role in effective sawing and development of these materials. Proper use and installation of diamond band saw blade is critical to its cutting efficiency and life. 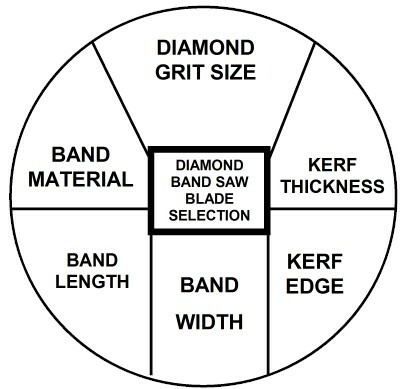 The following suggestions, will help you get the most out of your diamond band sawing operation. Step 3: Place tensigage on the diamond band saw blade in intentioned condition. Step 4: Zero gage, then tension to 1.5 units. Diamond Band Saw Blade tension should be set as low as possible to saw your material while still maintaining straight cuts. Step 5: Run Diamond Band Saw Blade slowly to properly track on tires. Step 6: Release the tension and retention to 1.5 units. Check the tension at beginning of each shift. Step 7: Make sure your diamond band saw blade is not toughing back up bearings. Rubbing back up bearings will cause premature failure in the backing material of the diamond band. Step 8: Set table speed to cut at four square inches per minute. This is only a recommended starting point. Keeping accurate records on every band saw blade will help you adjust the feed rate to optimize the total square inches of sawing for one diamond band saw blade. Step 9: Set band speed to approximately 1500-2500 surface feet per minute. Again, keep accurate records on every band. Step 10: Allow only enough table feed to permit the diamonds to cut freely. Overfeed will cause the diamond band saw blade to rub excessively against back up bearings resulting in early fatigue. Step 11: When stopping production reduce diamond band saw blade speed to eliminate start up shock. Step 12: Make sure to remove tension from diamond band saw blade when not in use. Step 13: Occasionally dress diamond band saw blade with silicon carbide dressing stick. Dressing band saw blade will clean, sharpen, and renew the diamonds. Step 14: Weekly inversion of the diamond band saw blade may improve cutting life. It is recommended that diamond band saw blades be used on most saws, ideally ones with 26" wheels or larger. This set up procedure will help reduce the problem of early diamond band saw blade fatigue. Guide Blocks - Check periodically for war and regrind as needed. Setting the guides for .001" - .0015" band clearance is important for straight cuts. Upper Wheel Slide Assembly - As this area seriously effects band tensioning it must be kept clean. Flush the area with coolant at least once per day. Lower Wheel Area - Again flush with coolant once per day. Tires - Grooves in the tires must be kept clean to prevent hydroplaning and to maintain proper tracking. Check during installation of each new band saw blade. Overall Cleanliness - Wiping sown the machine daily can help remind everyone to maintain all the important parts inside the machine. Operator Training - The most important of all, including keeping accurate records on each and every diamond band saw blade. Proper setup, use, and maintenance of your diamond band saw blades will optimize blade life as well as increase total square inches of material cut by one diamond band saw blade. Cross section should be specified as wide and as thick as possible (as the application will allow). Please note the diameter of the pulley. Steel band thickness should be in the range 1:1000 with respect to the diameter of the pulley. Band height is determined by the type of cut. For straight cuts, specify the maximum possible band height. In principle, continuous rim diamond band saw blade can be used of cutting all materials. The cutting edge is recommend for thin walled an delicate materials. If segmented band saw blade design is used, there should always be two teeth simultaneously engaging the material. The advantages of segmented design are better transport of coolant and better chip removal, with softer, long chipping materials. However, the surface finish on the material is somewhat rougher. long chipping materials should be cut with coarser diamond size band saw blades.